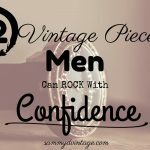 Understanding how to date vintage clothing is like putting together the pieces of a giant (but gorgeous!) puzzle. 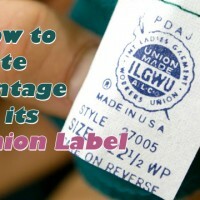 This article will help you understand how a union label’s design speaks to the authentic age of your vintage garment or accessory. Most vintage lovers would recognize the International Ladies’ Garment Workers’ Union (ILGWU) label, found in women’s vintage clothing from as early as the 1920s. But there are more union labels to be found in vintage clothing than just that of the ILGWU. There are labels for millinery (hat) unions, men’s clothing unions and other unions which made women’s clothing and suiting during the 20th century. These were the unions that helped to not only influence the history of American fashion, but the legalization of fair working conditions for the hundreds of thousands of individuals who worked these factory jobs. 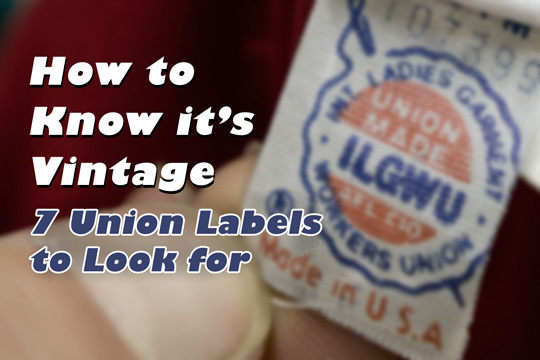 Keep reading after the jump to learn more about seven American unions and how to use their label design to help date your vintage garment! Do you have a vintage union label that you need help identifying? I’d love to see it and figure out its origin and era! 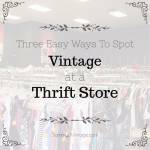 Send me an email or leave a comment below the post for help dating your vintage clothing, or by saying hello on Twitter, Facebook, Instagram or by subscribing to my newsletter! 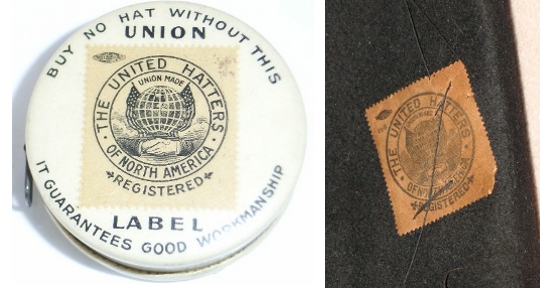 LOOK FOR … a union label by The United Hatters of North America (UHNA). The label was trademarked in 1915 but was first used in 1885. LOOK FOR … “United Hatters Cap & Millinery Wrks” on top of a globe and handshake design with “Int Union” below. The key difference between this label and older versions is a production number (“785641”) and IN U.S.A. with a small “6” next to what looks like a squished globe. LOOK FOR … The National Recovery Administration (NRA) symbol of a navy blue eagle anywhere on your union label. The label’s overall design differed based on whether it was a jacket, hat, handbag (shown above) or piece of lingerie. BACKGROUND: A garment with a blue eagle on its union label means it was produced under the safe and fair working conditions of Franklin D. Roosevelt’s National Recovery Administration, developed during the Great Depression to create more jobs by forming unions. Here’s a promotional video from 1933 about the NRA, thanks to Jean Jean Vintage. 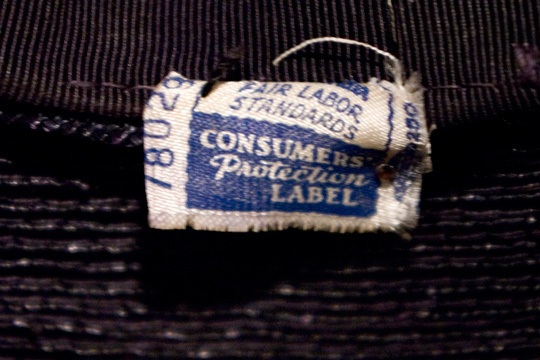 LOOK FOR … a blue & white label with the words “Fair Labor Standards” and “Consumers’ Protection Label” on a vintage hat. BACKGROUND: After US Congress declared FDR’s NRA law unconstitutional as part of his New Deal program in 1935, labeling changed to reflect rebranding after the Fair Labor Standards Act was passed in 1938. The name changed, but the idea renamed the same: All pieces with the Consumer’s Protection Label were made under fair working conditions (workers paid at least minimum wage, time and half for overtime and no employment of minors in oppressive work environments). 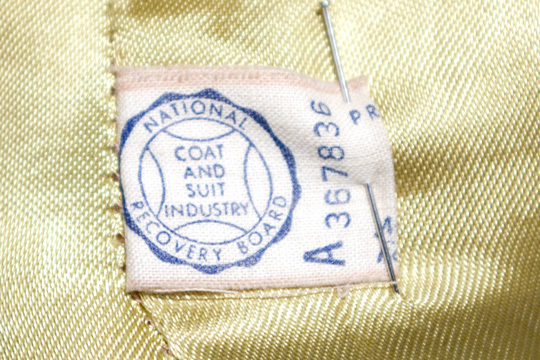 LOOK FOR … a scalloped circle which says “COAT AND SUIT INDUSTRY” with “NATIONAL RECOVERY BOARD” encircled around. 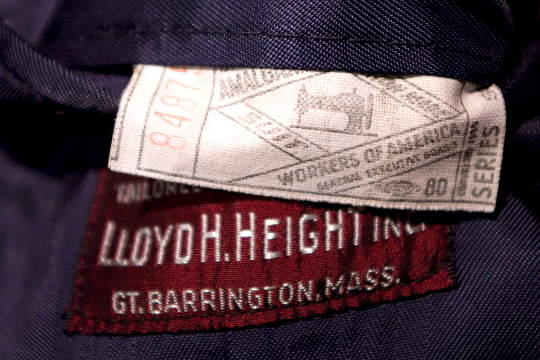 Hint: I found this specific label on a 1940s coat along the bottom side seam. BACKGROUND: The National Labor Relation’s Act encouraged growth in stateside unions to create more jobs during the economic crisis of the ’30s. The Coat & Suit Industry union was born out of FDR’s New Deal Coalition. 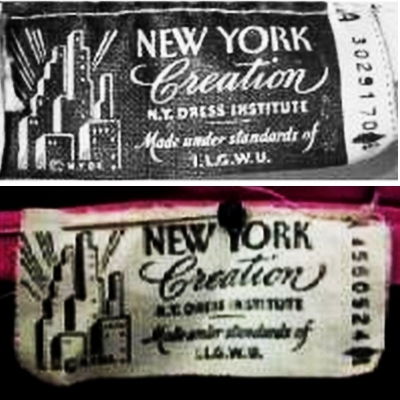 The union was operated under the standards of the ILGWU, but clothing with ILGWU union labels didn’t have a New York Creation label as well, and vice versa. Therefore, I consider N.Y. Institute union a separate entity from the ILGWU. BACKGROUND: The city of New York and the ILGWU developed the “N.Y. Dress Institute” as a marketing label to promote the Big Apple as a hub of fashion production. Consumers were encouraged to buy clothing with this label because they knew it was made by the stylish eyes of garment workers in the Big City. This is the group that began Mercedes Benz Fashion Week as we know it today! 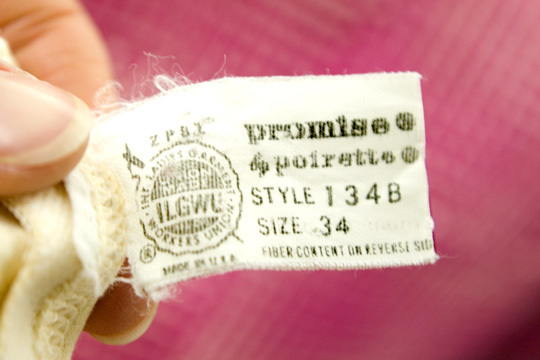 The garment is always identified on the label. Either “suit,” “workwear” or generic “garment” will be listed. There are five different Amalgamated Workers of America (ACWA) union labels. For a full description of how to identify them from 1934-1936, 1936 -1939, 1939-1949, 1949-1962 and 1962-1976, visit the Steel Zipper’s guide. BACKGROUND: The ACWA was founded in the early 1900s as a men’s suiting and workwear union, which it remained the primary producer of through 1976 when it merged with the Textile Workers of America. The ACWA was the largest manufacturer of men’s clothing from the 1920s through the early ’70s, which is why these labels are useful when identifying the era of men’s vintage clothing. 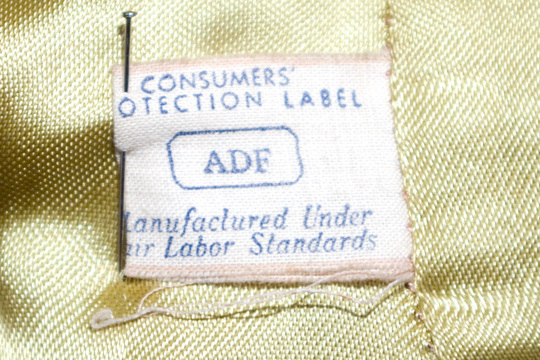 Read my guide on International Ladies’ Garment Worker’s union labels to learn how their identification helps when dating the era of your women’s vintage clothing. 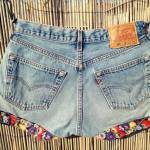 – I read your comment below but not sure how to date the hat since the production # is different than you give below? The key difference between this label and older versions is a production number (“785641″) and IN U.S.A. with a small “6″ next to what looks like a squished globe. DOES THIS MEAN THE LABEL WITH THE PRODUCTION # IS FROM THE 1930’S ??????? I have a soft beige, crushed velvet hat with a Marshall Field & Company tag. Underneath the size tag (22), there is the union label tag (United Hatters Cap & Millinery Wrks) with the number “7722”. On the opposite side of that is the word “MADE”, the squished globe with the number “6” next to it. Could you possibly give me some sort of time period? And tell me what the approximate price might have been at the time of purchase? I appreciate any help greatly. I have a dress with a Lavin label. On the back of the washing instructions is an Amalgamated Workers of America symbol. There is no RN number. Is this authentic? 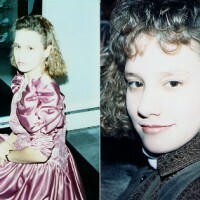 If so, about what year would this dress have been made? Any help would be appreciated. Thank you. I have a dress with a Lanvin label. On the back of the washing instructions is an Amalgamated Workers of America symbol. There is no RN number. Is this authentic? 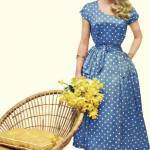 If so, about what year would this dress have been made? Any help would be appreciated. Thank you. I have a coast of ILGWU 318469. Do you know what’s the year? Hello! I have a (seemingly) faux fur vintage swing coat. 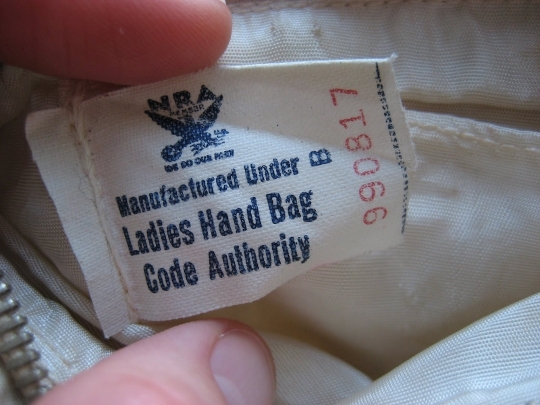 The women’s union label dates it to 55-63. But on the flip side, is a coat union stamp. Which I do not know how to date, because it has no relevant back markings. Is this combination of labels common? Too bad I can’t submit photos in a comment. Hello! I have a 100% camels hair coat with a national recovery board coat and suit industry tag stamped with by 863674. How old is it and is it worth anything possibly? 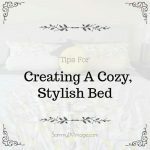 Hello and thank you for this post! I am so glad I found it! I have a coat that is a camels hair and fine wool blend. It has the exact same label that your suit has. I couldn’t find any useful information on it anywhere. Would you mind taking a few moments to email me and let me know what I have and how I might be able to get it appraised? Also, id love to hear from others who have the same coat or anyone who may know a little something about this. Anyone who can give me any information at all, please email me! [email protected] thank you again for this post, and thanks in advance for your help everyone! Do I have a treasure? Union Hatters with stitched tag ‘JP 815095’ with the squished globe and 6. Beautiful brown felt flapper hat with leather trim and bow. Thanks! Hi. Thank you for the helpful information. I have a men’s overcoat made by the AMALGAMATED GARMENT WORKERS OF AMERICA, which I believe later became the AMALGAMATED CLOTHING WORKERS OF AMERICA. It has a rectangular label in it with a sewing machine illustration in the center.The Number: 835474 is in red on the left-hand side. The label reads, ISSUED BY AUTHORITY OF AMALGAMATED GARMENT WORKERS OF AMERICA, “UNION MADE,” GENERAL EXECUTIVE BOARD with the Number 60. On the right-hand side, it reads, “COPYRIGHT” with, I believe, a year, which is Illegible. Below that, it reads, “SERIES GFJ.” I believe this coat was made between 1895 and 1914, but I’ll be very interested to know more precise information regarding the exact year. If you would like, I could send you a photocopy of the Label. Any information you have regarding this coat will be greatly appreciate. Thank you so much. I have a long black ladies coat. The label is the ILGWU, INT. LADIES GARMENT WORKERS UNION. On the reverse side of the label says, NATIONAL BOARD, COAT AND SUIT INDUSTRY. A few more words I can see and ID number 96515? Can’t see the end numbers. Can you date this and lead me to more info on its possible value? I have a beautiful red velvet coat with satin lining that has the vintage union label. The coat is in immaculate condition. The tag was seen into the seam of the lining and I couldn’t find any information from the part that was showing. The label was seen mostly inside the liner. I popped a stitch and it came out and then I started to research it. I fear I made a mistake by doing that but I had no idea what the tag said. I’d like to know more about it. I have a hat that looks like the yellow hat listed above under the “United Hatters Cap & Millinery Wrks” on top of a globe and handshake design with “Int Union” below. section, but the production number is 115269. Do you have any idea how old this hat is? Hi I have some vintage Union Made hats that I would like to get dated. I have been thinking of donating them to the highs chool drama program but would like to know what I have first if I sent pics could u help me? I have a 40″ black ladies coat with 3/4 inch sleeves. in pristine condition. It’s more of an A-line style with two large buttons to close it. The sleeves and collar are lined with black fur. It smells like real fur, but it was a gift so I am unsure. This was given to my mother back in 1985, from a friend that worked in Washington DC with all the “politicians wives.” The label looks like the ILGWU, INT. LADIES GARMENT WORKERS UNION one from the 1955 to 1963 era. On the reverse side of the label says, NATIONAL BOARD, COAT AND SUIT INDUSTRY. Could you assist me to date this item and determine the possible value? Also, I’m not sure where to go to sell this item. My mother and father nearly 80 years old, so i’m trying to help them downsize to prepare for senior/assisted living. I will gladly send you pictures. Thanks so much. 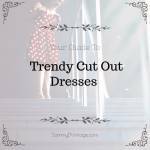 Hi, i ran across your blog when i did a search of vintage labels. My mom had a coat, can’t figure out where it came from, maybe my grandmother… Anyways, i would love to send you pics of the label and the coat, and see if there’s a chance you could help identify the age and maybe lead me in the right direction of finding its worth.